The weather was quite good, visibility and the cloud base were all in my favor for going solo in the local area, the wind however, was almost a perfect crosswind. The active runway was still 23 though so I felt experience of circuits on this runway would see me through. The plane that hates me…. My much loved G-SHWK is in the hanger with its cowling off and engine exposed, so we’d be taking G-UFCB. This plane hates me……I don’t like it much either. Oh you might laugh and think a plane can’t hate someone, how wrong you are. G-UFCB historically has refused to start for me, used to stall when power was set to idle, makes weird creaking noises (or it used to, I’ve been avoiding it for so long). We’ve not had the best of crosswind lessons together either. It hates me, I hate it, we avoid each other – it’s a strange relationship, but it works. Upon going out to check the plane, I was reminded that if there was any ice on the wings (inc. the top) then I had to come back and inform my instructor – but the hope was it would have melted by now. So armed with brooms, we climbed up onto the struts and made an attempt (all be it one that must have looked quite mad), to shift the ice off the wings. That made me smile, but I think it served its point – time to move it to the heated hanger. I got the job of taxi driver again, but of course after radioing the tower to get permission to taxi, G-UFCB hates me, so why on earth would it start for me?!?! No of course not, it would just splutter and make no real effort to turn over. Thanks! In one last desperate (and let’s pretend I actually know what I’m doing) effort, I stopped for a second, then primed the engine again and with one last muttering prayer turned the key……and voila, Charlie Bravo started! Stress, just a little, but it wasn’t going to end there. Taxing over to the hanger, all very normal nothing new – but what to do when I get there??? There were 3 people in hi-viz jackets, I didn’t know where they wanted me to be: Am I getting to close? Should I come closer? Are you going to move? If they were making me gestures they were half-hearted, but to be fair to them they probably thought they were dealing with someone who’d dome this before (heck, they probably thought I’d had at least one coffee this morning too, but I hadn’t). In the end my instructor came to the door and relieved me of my stupidity…….turn the engine off, you can’t taxi inside, it has to be pushed. Where’s the box on my training log for feeling stupid? We can tick it completed now. All heated up and deiced, Charlie Bravo was now out on the taxi way, blocking everyone – time to go, pronto. 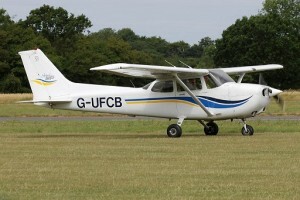 That was the plan, G-UFCB had other ideas, it now refused to start again. My instructor gave it ago, nothing. The other instructor came over and had a look, with a little hand turning of the prop and a few more goes, it fired up! Finally, I was feeling a bit more relieved about my previous reluctance to turn the engine off. Time was disappearing, we were blocking the taxiway, we really had to go now! Except with all the backwards and forwarding, I hadn’t set my seat position (and the last pilot must have been taller than me!). I’d regret this indecision to stop and regardless of who we might block, I should have sorted that seat out. After completing power checks we were just about to move to a position ready to call ATC to declare ourselves ready for departure – except my instructor had keener eyes then me and had spotted my index finger was streaming blood! G-UFCB has now drawn blood from me, that sums up our relationship. If you’ve ever questioned why there’s a first aid kit on the checklist – now you know! In all the activity, the active runway had been changed to 05 due to the wind – I haven’t flown a right circuit for months, back when I was doing solo circuits. Doubt was creeping into my head: Could I actually remember the turn points? My first circuit is often a bit rough, this was no exception, the crosswind made me converge (my current topic of “arrrgh”). Leveling out was interesting, my seat was so low that if I looked straight out of the plane I was actually starring into the top of the instrument panels – not surprisingly then I was getting comments to not watch the instruments. Yet at this stage it hadn’t even clicked in my head the seat wasn’t set right. Then being a crosswind, it meant the base leg was much faster…….it’s funny, in reality the tail wind is only really adding 5-10 knots of ground speed, yet it made a world of difference. My memory of this circuit is of having a voice in my head reminding me where to turn, unfortunately maybe I fly differently to most other pilots, but that first turn right onto base put us way to close. The crosswind then sped the world up and a combination of wrongness ensued – no doubt not helped by my brain trying to work twice as hard on a circuit route I’ve not done for ages. To add to the woes the seat position being to low, now resulted in a perspective that when combined with the crosswind meaning the nose had to be put 45 degrees right of the runway, was at best not great and at worst – utterly rubbish (regretting rushing the seating). All this concluded with a hard, not flared very well, wing not put into wind, rubbish landing…… it made me grimace on the touch down, I now define any landing that makes me do this as rubbish. That first landing was so all over the place (overshot final, hard landing etc.) that I had a suspicion in my head it was going to be hard to come back from that with respect to box ticking. Attempt two was perhaps a shade better, but I was converging again (I might re-title the blog at this rate) and it wasn’t really feeling instinctive. Base leg was another one turned too soon, making an immediate turn to final required (which was also overshot). If I describe the landing as “less hard” perhaps that’s the best way to describe it. Again I felt like I was flying absolutely for the numbers with an intent to hit them at all costs – if I was hitting them, I was hitting them very hard. This is an old landing habit of mine, I used to do it when I first started flying circuits and I could repeat it, lesson in, lesson out, no amount of hours seemed to make any difference. It stopped when another instructor had a different strategy for landing. Now my habit was back and it’s a bizarre thing, you know you don’t normally fly like this, but you are and no amount of thinking seems to fix it – I suspect the answer is to actually stop thinking so much. On the climb out of this landing, it didn’t take a rocket scientist really, but the call was made the landings were not up to scratch today. We’d do a few more to try and sort it out. I can’t take all the credit, verbal encouragement was needed to stop me drilling the plane into the 05 numbers regardless of whether the final approach had been good enough to touch down there or not. Flying a bit further down the runway and having that extra bit of time to bring it all together resulted in a much calmer nicer landing. Apparently my turn on to base was being done with too much rudder and I was side slipping in the turn. This is where I’m going to nod my head, play the “legally I don’t know what I’m doing, so I’ll bow to your wisdom” card…….and then make a statement that may have no bearing on fact 🙂 You have been warned: If this is what I was doing wrong, I’m baffled as every approach was high, I should have been dropping out of the sky like a rock. More often then not I was taking 3 stages of flap because it was essential, not because it was there and I’d been trained to land that way / lower the third stage at 200-300ft etc. It got a bit better, I think I got a bit calmer, but events re-enforced that me and Charlie Bravo don’t get on much (that being said my last lesson had been rubbish as well and that was in the much loved Whiskey Kilo). The back of your mind thought that in two circuits, the objective of this lesson had gone whooshing out of the window perhaps didn’t help my mind set……..and all my bad habits have returned since the last lesson so I can hardly blame that. The landings didn’t get much better though, the convergence was clearly so rubbish that air traffic even told me off for it (or more accurately told me to sharpen it up due to a plane flying in directly onto final). Another distinctly average affair, Christmas has taken its toll. Got to get back on this horse. Well, actually……someone has cancelled, 9am tomorrow. An instructor I’ve never flown with before, hmmm not exactly what I wanted – there are a couple of names I was hoping to be free who I historically fly well with. Fly tomorrow with someone totally new to me, or leave it a week??? I decided to leave it. A decision that rattled around my head all of the short drive home. Forget it, I need to fly again: Immediately, at this point in time I needed to know if my flying is really back to square one, or if this is just a bump. I can’t wait a week, a week and I’ll be doubting myself because there’s been a gap. A quick call back to the club and the 9am slot was mine. Now we’d have to see what tomorrow would bring….. This entry was posted on Saturday, January 19th, 2013 at 7:55 pm by PHC	and is filed under Actual Lessons, PPL Course. You can follow any responses to this entry through the RSS 2.0 feed. You can leave a response, or trackback from your own site.